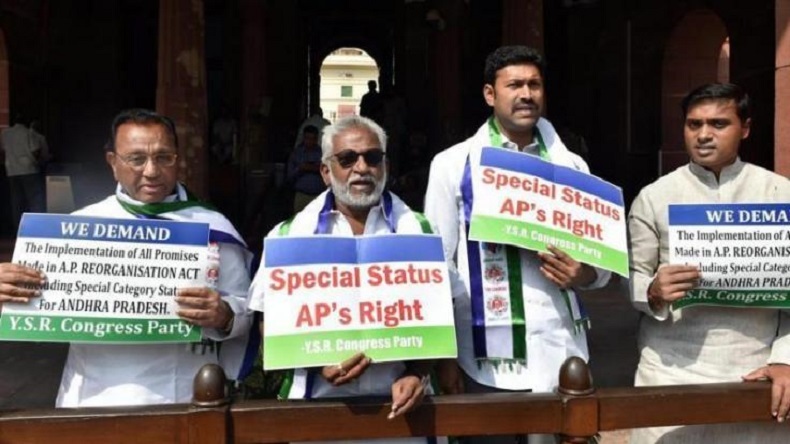 The MPs of the YSR Congress Party persisted with the indefinite hunger strike at the Andhra Pradesh Bhawan over on Saturday, April 7, over the demand of granting special status for Andhra Pradesh. The MPs have disrupted proceedings in the House for consecutive 22 days and were the first party to move a no-confidence motion against Narendra Modi-led Centre over the issue. YSR Congress Party persisted with the indefinite hunger strike at the Andhra Pradesh Bhawan over on Saturday, April 7, over the demand of granting special status for Andhra Pradesh. They also performed pooja at the site. On Friday, 5 MPs submitted their resignation to Lok Sabha Speaker Sumitra Mahajan on the last day of the budget session of the Parliament over the same issue. The MPs have disrupted proceedings in the House for consecutive 22 days and were the first party to move a no-confidence motion against Narendra Modi-led Centre over the issue. The 5 MPs are V Vara Prasada Rao, YV Subba Reddy, PV Midhun Reddy, YS Avinash Reddy, and Mekapati Rajamohan Reddy. Immediately after the resignation of the 5 MPs, YSR Congress supremo Jagan Mohan Reddy challenged the Andhra Pradesh chief minister N Chandrababu Naidu, asking him to order the ruling party, Telugu Desam Party’s (TDP) lawmakers in Parliament to quit. He also announced about the Saturday’s hunger strike. Furious regional parties from the Andhra Pradesh have witnessed a showdown with the Narendra Modi-led Bharatiya Janata Party government over granting special status to the state. Recently TDP pulled out 2 of its ministers from the Union Cabinet and also quit the National Democratic Alliance (NDA) over the issue. On Thursday, April 5, a protest led by as many as 17 Opposition parties at the Mahatma Gandhi statue in Parliament premises against the ruling Bharatiya Janata Party over various issues, which included SC/ST Act, atrocities on Dalits, Farmer distress, failing to constitute Cauvery Water board, granting special status to Andhra Pradesh among others. United Progressive Alliance (UPA) Chairperson Sonia Gandhi and newly elected Congres party president Rahul Gandhi mainly led the demonstration. Members of the Opposition were seen holding placards which read, “#Farmer distress, #NoDalit Atrocities”.